I was recently reading an Alber Elbaz interview where he declared himself a little disappointed by the business side that these mini-collections have been taking in recent years. 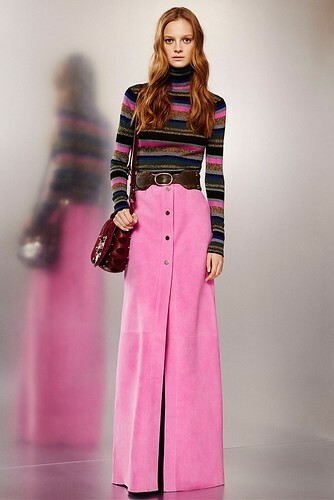 At first, the pre-fall was a preview of the best pieces from the fall/winter collection to come, presented to a small and very informed public. But today, pre-fall stands for a reinterpretation of the last automn/winter season best sales. It is ultimately a “post” rather than a “pre”-collection. Alber Elbaz, designer for Lanvin since 2001, would love to see more clothes that make women dream and not only clothes women love to buy. But, when you know that today a designer is not anymore an all-powerful creator but an artistic director who must take into account the house strategic decisions and its customers taste, his words sound like an utopia. Alber Elbaz himself declares not always looking for new ideas, but reworking the same from one season to another, like a perpetual search for perfection. Among the pre-fall collections, I was mostly seduced by those that did not seek to impose a new line. I found the most beautiful expression of an ageless and glamor aesthetics to the Italian houses: Gucci, Pucci and Fendi. 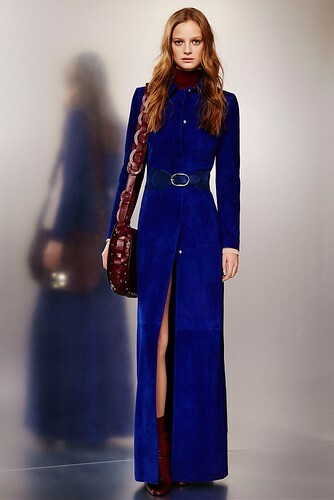 For Gucci, Frida Giannini managed to revive the golden age of elegance by choosing timeless shapes (flared pants, long and mid-knee dresses) in two self-enhancing colors: brick-red and anthracite-blue. The leaf pattern was treated like an optical camouflage rather than a naive fall garden. For Fendi, Karl Lagerfeld has cut out the fetishes materials of the house (leather and fur) in stripes that he then re-assembled in coats and dresses folowing a colorful sophistication. We would like to believe that he only used the scraps to reconcile with the animal rights defendants. For Pucci, Peter Dundas cut very classic shapes in pink and indigo blue suede. The knits remain close to the body. Optical prints come in several neon colors. For evening, jewels and lace remember two reliable values of a timeless elegance. In my case, I’ve seen enough to dream and feel inspired. Must still find these wonderful materials on fabric markets that are accessible for all. This entry was posted in Moods and tagged pre-fall. comme vous, j’en ai assez de rêver, j’aimerai trouver ces beaux tissus pour réaliser autre chose.